We are proud to announce that Megan Cohen Berkman will be leading KRAVolution as a Head Instructor! Megan was introduced to Krav Maga during her military service in the Israel Defense Forces where she started as a Boot Camp Sergeant and then became a Military Krav Maga Instructor. During her two years of service, she taught hundreds of soldiers and was fortunate enough to meet Imrich ‘‘Imi‘‘ Lichtenfeld himself. Today Megan is one of the highest ranked women in the world of Krav Maga. Her teaching skills started at the age of 14 and in the following years she qualified as an Instructor for gymnastics, fitness instructor and personal trainer at Wingate Institute in Israel. 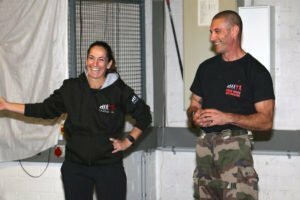 In 1995, Megan was one of the people who brought Krav Maga to France and neighboring countries and returned to Israel in 2009. 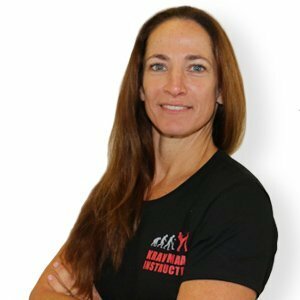 She has been involved in Krav Maga now for almost 30 years, travelling throughout the world to run seminars and courses and spread and share her knowledge and experience (USA, Canada, Australia , Great Britain, France, Italy, Greece, Germany, Hungary, Bosnia, Holland, Cyprus, Switzerland, Spain and more). Today Megan is a Head Instructor of KRAVolution, whose ideology is based on sincerity, honesty, friendship, experience and last but not least professionalism. We looking forward to the continuous evolution of our KRAVolution Organization with the experiences of Megan Cohen Berkman. 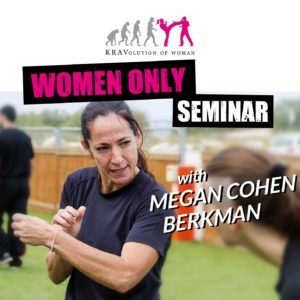 The next seminar with Megan will take place this Saturday, 28th of October at the KMI Cologne, Germany: Women Only Seminar with Megan Cohen Berkman.